The Tibialis anterior (Tibialis anticus) is situated on the lateral side of the tibia; it is thick and fleshy above, tendinous below. The fibers run vertically downward, and end in a tendon, which is apparent on the anterior surface of the muscle at the lower third of the leg. This muscle overlaps the anterior tibial vessels and deep peroneal nerve in the upper part of the leg. Variations.—A deep portion of the muscle is rarely inserted into the talus, or a tendinous slip may pass to the head of the first metatarsal bone or the base of the first phalanx of the great toe. The Tibiofascialis anterior, a small muscle from the lower part of the tibia to the transverse or cruciate crural ligaments or deep fascia. Intermuscular septum between it and the Extensor digitorum longus. Medial and under surface of the first cuneiform bone, and the base of the first metatarsal bone. The client is supine. Place your resistence hand on the medial side of the distal foot. Resist the client from dorsiflexing and inverting the foot. Look the distal tendon of the tibialis anterior on the medial side of the ankle joint and foot; it is usually visible. Palpate the distal tendon by strumming perpendicula across it. Continue palpating the tibialis anterior proximally to lateral tibial condyle by strumming perpendicular to the fibers. 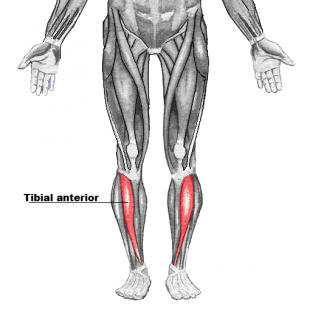 Once the tibialis anterior has been located, have the client relax it and palpate to asses its baseline tone. The action of the tibialis anterior muscle is considerably superior that others three dorsal flextor muscles of the foot, both for the size and for its function that affects the entire foot. Emodin improves glucose metabolism by targeting microRNA-20b in insulin-resistant skeletal muscle. Structural Basis for the Distinct Membrane Binding Activity of the Homologous C2A Domains of Myoferlin and Dysferlin. Adropin reduces blood glucose levels in mice by limiting hepatic glucose production. Impact of Sarcopenia and Frailty in a Multicenter Cohort of Polypathological Patients. ↑ Drake R, Vogl W, Mitchell AWM 2004 Gray’s Anatomy for Students. Edinburgh: Churchill Livingstone.